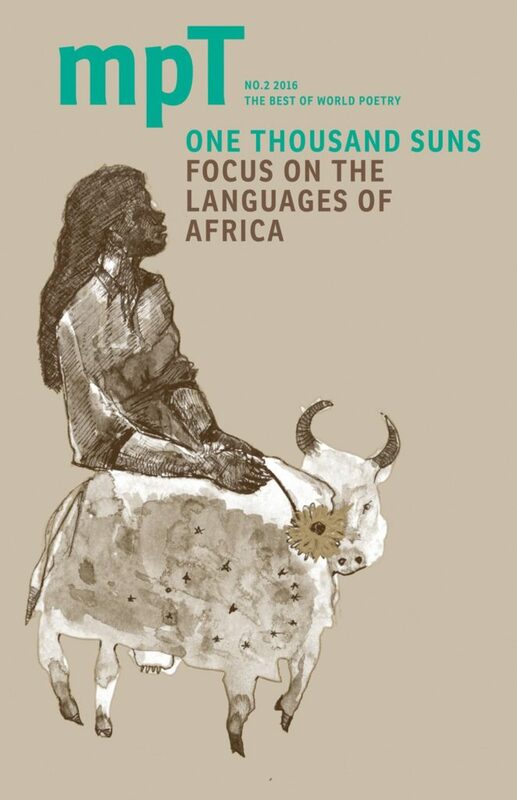 MPT’s summer issue ‘One Thousand Suns’ focuses on poetry from African languages, with a selection of new translations of Senegalese poet Mama Seck Mbacké, Beninese Agnès Agboton and an interview with Equatorial Guinean Ricaredo Silebo Boturu. The African focus also includes an essay by poet and playwright Inua Ellams on translation, his Nigerian heritage and reworking The Tempest into Nigerian pidgen. We feature new translations of Hafez by UK poet Mario Petrucci and Jane Draycott’s poem ‘The Occupant’, a response to the classic Dutch modernist text ‘Awater’. Read Jan Wagner’s new poems in Iain Galbraith’s prizewinning translation, Hindi poet Geet Chaturvedi and Romanian Nora Iuga’s surreal poetry – all in the groundbreaking magazine dedicated to poetry in translation: for the best in world poetry read MPT.